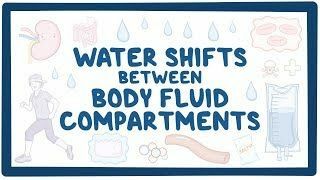 Osmosis: Water shifts between body fluid compartments. (2019, April 20). Retrieved from (https://www.osmosis.org/learn/Water_shifts_between_body_fluid_compartments). Fluid balance is a necessity for maintaining healthy body functioning. When there are disturbances that alter solute concentrations or water balance, water can shift between body fluid compartments and lead to various clinical symptoms like edema. Normally, approximately one-third of total body water is located in the extracellular space while the remaining two-thirds is found in the intracellular space. Because water follows solutes, the volume of a given body fluid compartment depends on the amount of solute contained there. Sweat is (isosmotic/hyposmotic/hyperosmotic) relative to extracellular fluid. Water is the key to life - It has very unique properties like being an amazing solvent, which means that it’s easy for solutes to dissolve into water. As a result, water can carry essential nutrients to our cells as well as toxins or waste products away from our cells to be excreted out of our system. Total body water can be subdivided into two major compartments, intracellular fluid (ICF) and extracellular fluid (ECF). On average total body water in a person is about 60% of their body weight. From the total body water, 2/3 of that, or 40% of body weight is intracellular fluid. The other 1/3 or 20% of body weight is extracellular fluid. This is also known as the 60-40-20 rule. Intracellular fluid is the fluid which is inside the cell and extracellular fluid is the fluid outside of the cell. Extracellular fluid can be further subdivided into interstitial fluid, which is the fluid surrounding the cell and plasma which is the fluid that circulates within blood vessels. Extracellular fluid is the first to be lost and makes up fluids like gut fluids, sweat and other secretions. The extracellular fluid is made up of different solutes, the major cation being sodium (Na+) and the major anions being chloride (Cl-) and bicarbonate (HCO3-). Each compartment has a specific solute concentration measured in mOsm/L or osmolarity, which is the number of osmoles within a liter of solution. Now remember that an osmole refers to the individual ions within a solution. So for example, NaCl splits apart in water to become Na+ and Cl-, so a solution of 1 mmol/L of NaCl is actually 2 mOsm/L. Normally, osmolarity in the intracellular fluid and extracellular fluid is equal. If either side ever has a few more solutes, than water will flow in that direction to lower the concentration slightly and maintain the balance. This process is called osmosis. Now, some solutes like NaHCO3 (sodium bicarbonate) as well as large sugars like mannitol, are too large to cross cellular membranes and they’re basically trapped in the extracellular fluid. Usually, the ECF is more easily affected by physiologic processes, so we’ll look at the volume and concentration of the ECF. In terms of volume, contraction means a decrease in ECF volume, and expansion means an increase in ECF volume. In terms of concentration, an isosmotic disturbance means that there’s no change in ECF osmolarity, a hyperosmotic disturbance means that there’s an increase in ECF osmolarity, and a hyposmotic disturbance means that there’s a decrease in ECF osmolarity. We’ll go through six common scenarios to see how they affect the body’s fluid compartments, and we’ll use a two step approach for each scenario. First, we’ll identify any changes in the ECF osmolarity like adding or removing solutes or gaining or losing water. Second, if there is a change in ECF osmolarity, we’ll figure out how water must shift to re-establish balance between ECF and ICF osmolarity. The first situation is diarrhea. Someone with diarrhea will lose a lot of fluid and solutes from the gastrointestinal tract which ultimately comes from the ECF. And the osmolarity of diarrhea is similar to that of the ECF. In other words, losing fluid in the form of diarrhea, means that there’s less ECF fluid, but it’s osmolarity is unchanged. With no change in osmolarity, there will be no water shift and ICF volume stays the same. This means that there’s an isosmotic volume contraction. Consequences include a decrease in plasma volume leading to a decrease in arterial pressure as well as an increased plasma protein concentration and an increased hematocrit, which is the portion of blood that’s occupied by red blood cells. The second situation is a person running a marathon and losing a ton of sweat which contains both Na+ and Cl- ions and water. Interestingly, sweat is actually hyposmotic relative to ECF so it contains relatively more water than solute. When a hyposmotic fluid is lost from the ECF, the volume of the ECF decreases, and the osmolarity increases. When the osmolarity in the ECF rises compared to ICF, water moves by osmosis from the ICF into the ECF.